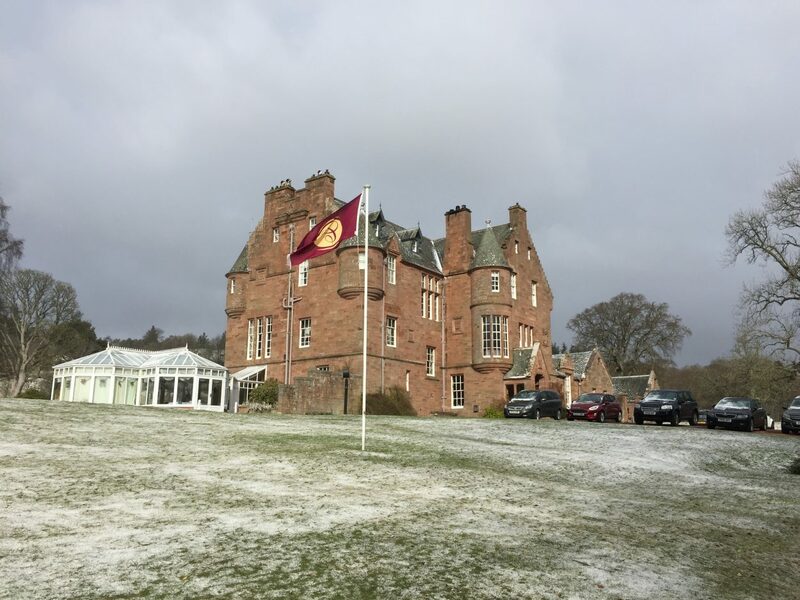 Cringletie House Hotel – A castle hotel close to Edinburgh. Meandering up the long driveway in the car to Cringletie House Hotel just outside Peebles, we were impressed. When you park the car and seconds later there’s a smiling member of staff rushing out the door to help you in with your bags you can tell that you have arrived somewhere special. 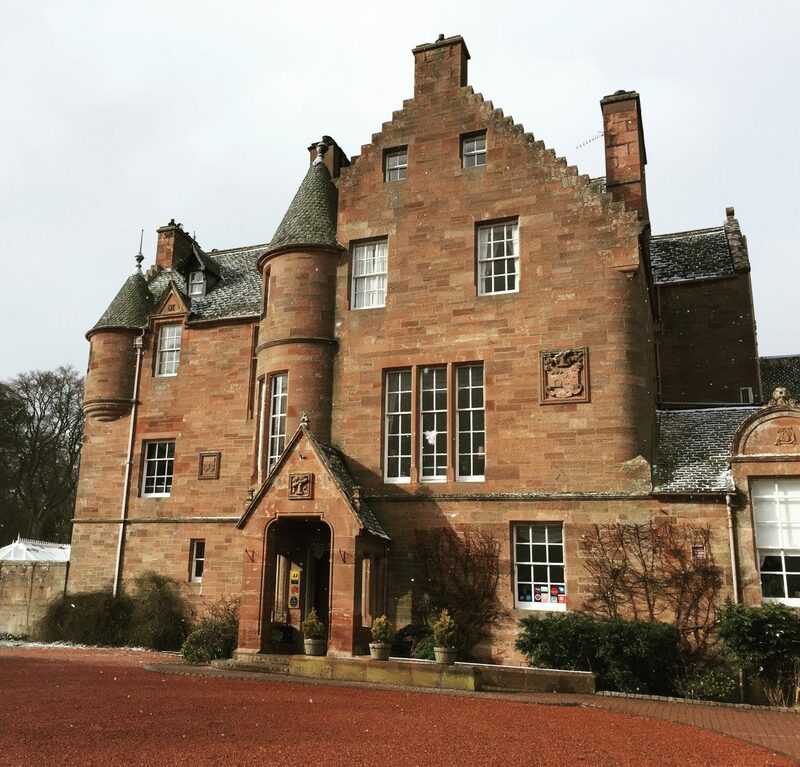 The thirteen bedroom Baronial house is beautiful both outside and in, and it’s obvious the owners really care about the building and surrounding grounds. There has been a Cringletie house on the site since the 1600s but the “castle” you see today was rebuilt in the mid-1800s. 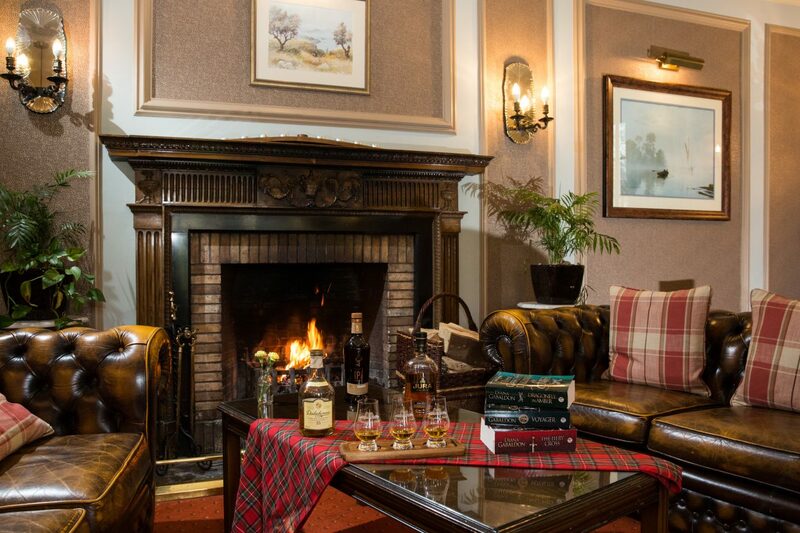 Inside the front door, the log fire was roaring and we were welcomed into the main reception area. Check in was warm and swift and we were shown to our second-floor bedroom by the lovely receptionist. At Cringletie House, most of the public areas are upstairs which is a nice change. 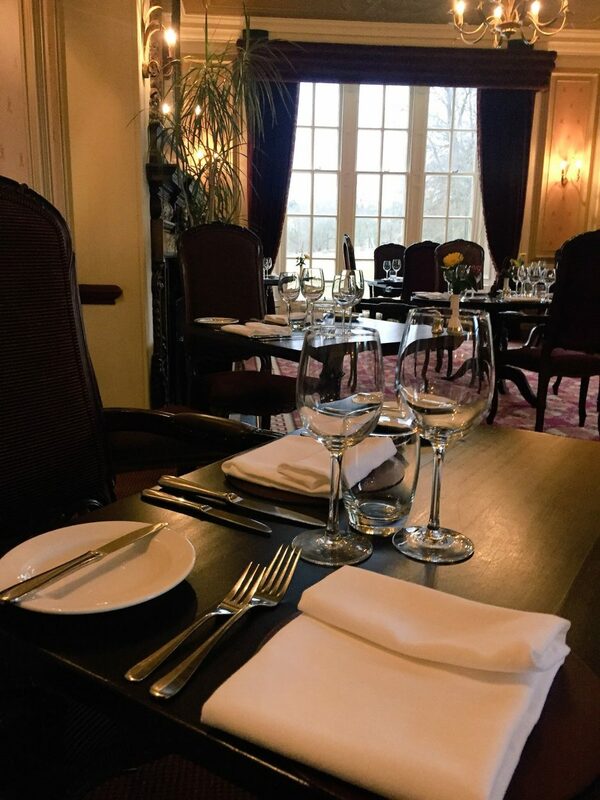 The bar and dining room are both located on the first floor and offer stunning views over the grounds and surrounding countryside. If you have mobility problems, don’t worry as the hotel has a lift, and bedrooms on the ground floor. 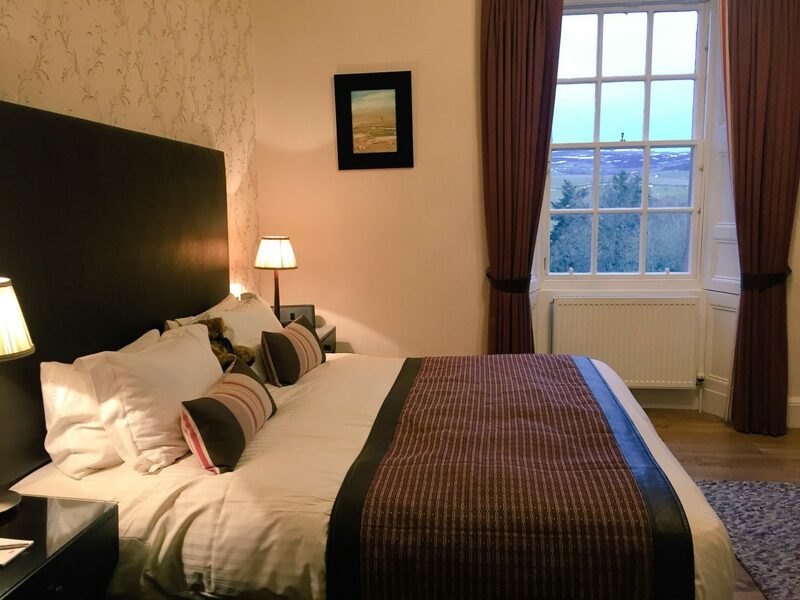 Fireplaces seem to be a theme at Cringletie House as our bedroom had one too – more for decoration than heat though!. Our bedroom was lovely and warm and cosy without the fire being lit, but it’s nice to have one. We also had a seating area in the turret and a hospitality tray with lots of choices of tea, coffee and hot chocolate on hand. The large modern ensuite bathroom with huge bath and full-sized Arran Aromatic Citrus Shores toiletries and fluffy towels was the ideal place for a pre-dinner dip. Dinner was booked for 7 pm, so we made our way down the elegant staircase complete with tartan carpet, to the dining room. Corridor lighting is dimmed in the evening to add to the country house ambiance. As you enter the dining room, the huge windows frame the view, candles twinkle and fresh flowers grace each table. Beautiful ceiling frescoes painted to commemorate the marriage of Elizabeth Wolfe Murray and Sir George Sutherland in the early 1900’s crown the dining room. 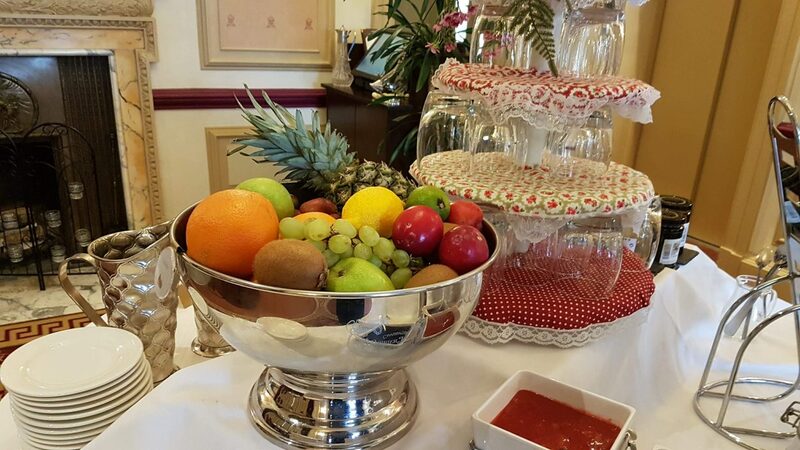 Service is professional, warm and friendly and we felt entirely at ease, relaxed and ready to enjoy our meal. The hotel was busy with guests, but the large dining room and generous space between the tables made for an intimate atmosphere. We chose a bottle of Sonsierra Tempranillo from the extensive and reasonably priced wine list. There was also a choice of olive, sun-dried tomato, turmeric, wholemeal or white homemade bread to nibble on while we waited on our starters. The fixed price dinner menu (£37.50) offers three courses plus coffee and hand-made treats. Each course has lots of exciting choices using a fantastic array of locally sourced Borders produce. 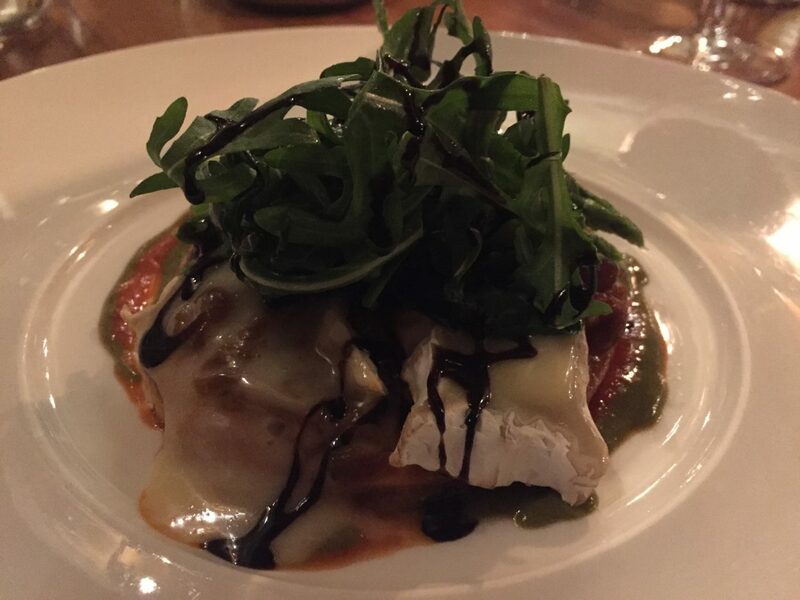 Vegetarians aren’t short-changed either as there is a whole separate menu of delicious dishes to choose from. An unexpected first dish, compliments of the chef arrived just before our starters. The light, crisp king tempura prawn with a lobster bisque was a great start to the meal giving us a real taste of the sea. 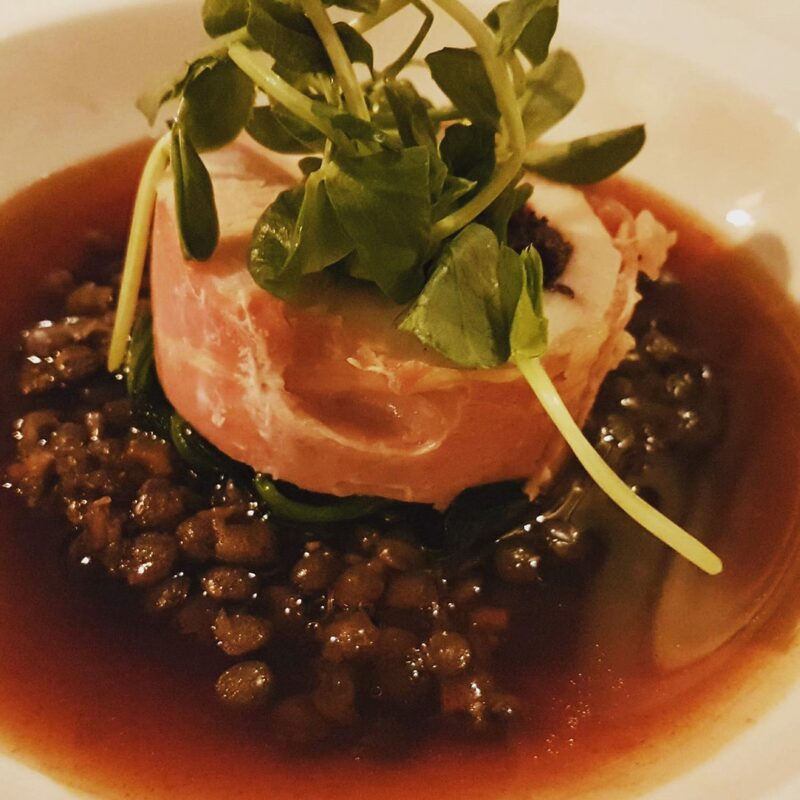 For starter, I chose tournedos of poussin stuffed with deliciously spicy Stornoway black pudding and wrapped in crisp cured ham. This was served on a bed of puy lentils, which retained a nice bite and included a selection of spring vegetables on the top. 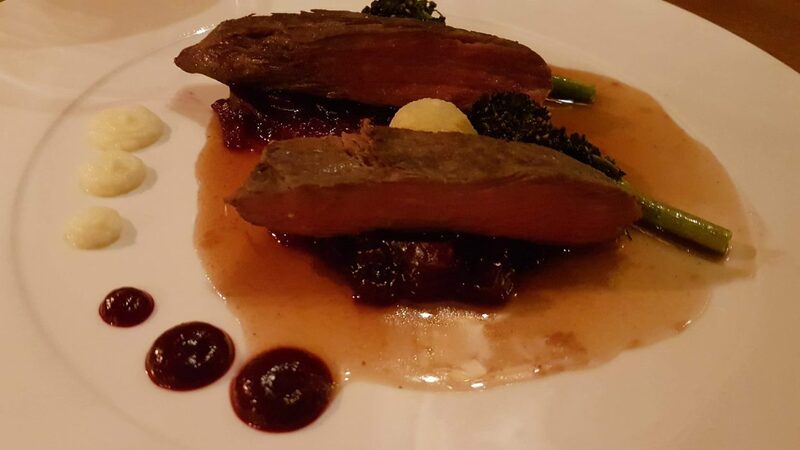 The dish was pooled with a rich red wine jus. Tournedos of poussin with Stornoway Black Pudding and cured ham, Puy lentils with spring vegetables and red wine essence. Raymond’s melting Pentland brie, asparagus and Provençal vegetable tart was tangy and rich with a robust tomato and vibrant red pepper sauce. A rocket salad with roast red pepper and basil pesto dressing topped the dish. It was a gooey Borders/Mediterranean mash-up that looked quite rustic but packed in a lot of flavour. Melting Pentland Brie, Asparagus and Provencal vegetable tart, rocket salad roast red pepper, and basil pesto dressing. For the main course, I chose grilled rump steak which arrived as two hearty slices on a bed of beetroot slaw, with roasted roots and sprouting broccoli. Hiding between the two chunks of meat was a delicious blue cheese puff. Parsnip puree and a tangy spiced beetroot gel decorated the plate in ever decreasing circles. One piece of beef was perfect but the other was a bit of a challenge for my 42-year-old teeth. The lady next to me was munching her way through the grilled fillet and all the oooh and ahhhs coming from their table were making me jealous and wishing I had upgraded to fillet! Raymond’s lime and chilli peppered seabass fillet arrived on a bed of Isreali couscous, pak choi, and roasted capsicums. The flavours were warm and aromatic with the lemongrass and blast of heat from the chilli. The dish was served with gingered prawns which added a subtle sweetness along with the teardrop peppers. The whole combination was a delicious hit. 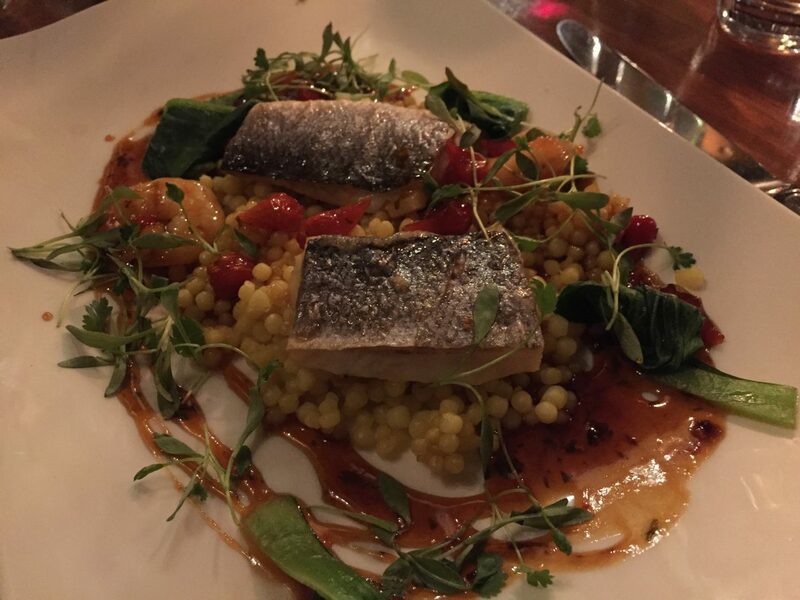 Lime and chilli peppered sea bass fillet with ginger prawns, Israeli couscous, Pak Choi and roasted capsicums, lemongrass and coriander dressing. We did just about have room for dessert, so we decided to order two different options and share. My Trio of Citrus was a tasting plate of three not so miniature desserts and created the dilemma of which end to start at. The lemon meringue pie won! The delicate meringue-shell topped a zingy lemon filling and crisp pastry case. It was gone in no time – oops – so much for sharing!. Next up was the lime mousse which I initially thought was a cheesecake but was pleasantly surprised by the light frothy texture of the mousse rather than the cloying creaminess of cheesecake. Finally, the warm citrus drizzle cake, combed with white chocolate sauce concluded the trio. 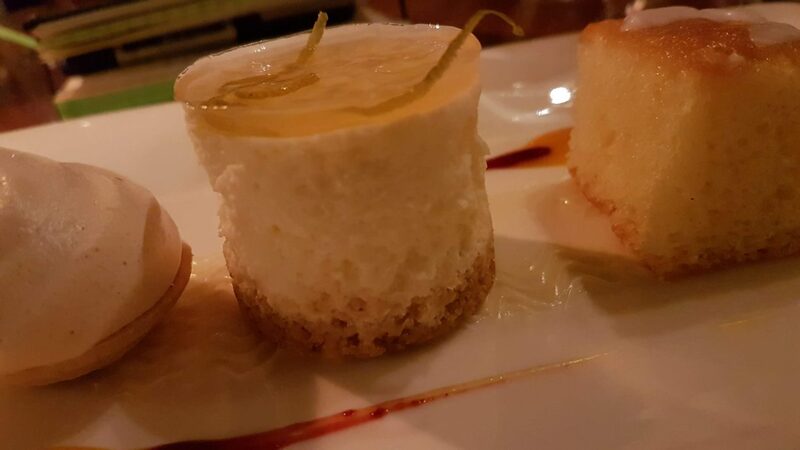 A trio of Citrus – Lemon Meringue pie, Lime Mouse, warm citrus drizzle cake combed with white chocolate sauce. 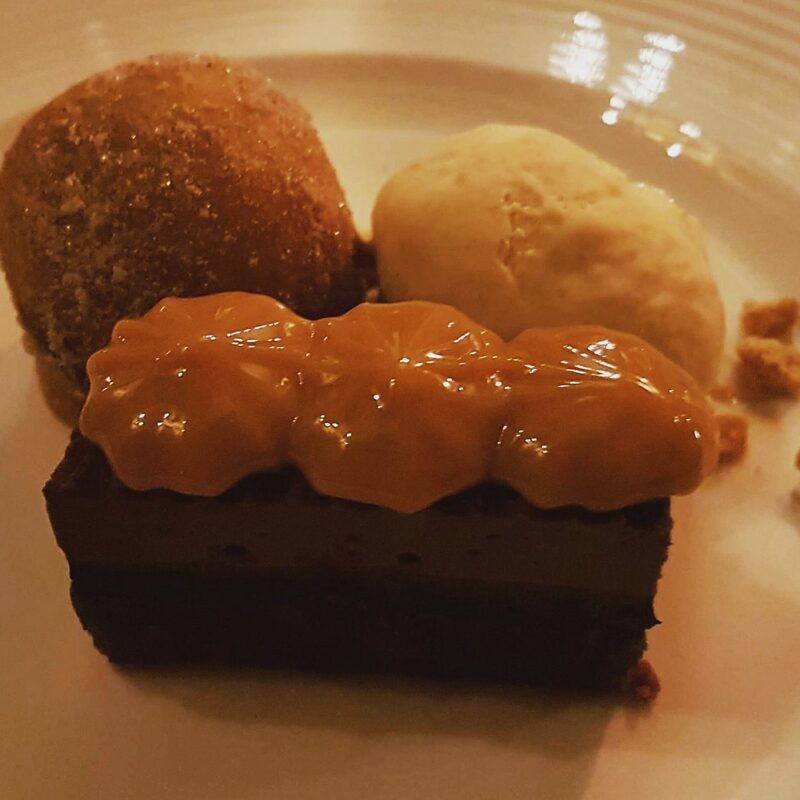 Our second dessert was Hazelnut delice which was served with the most amazing peanut butter ice cream. It had the added bonus of a hot chocolate and cinnamon doughnut with a molten chocolate centre. Oh my goodness – it was fabulous! If this wasn’t delicious enough a piping of dulce de leche added extra sweetness. 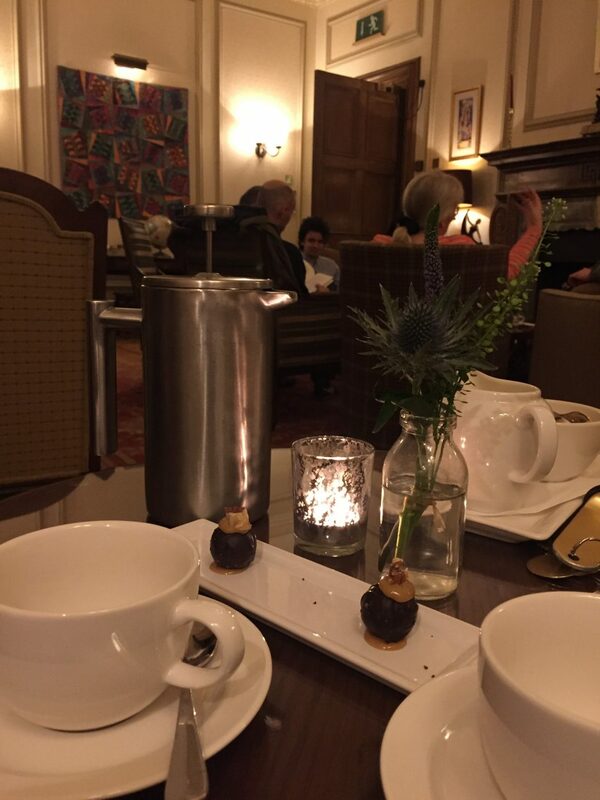 After dinner, we enjoyed a cafetiere of coffee and petit fours in the lounge before heading to bed. The turndown fairies had visited our bedroom while we dined, turning down the bed, closing the curtains and replenishing the hospitality tray. It’s a lovely touch. After a peaceful nights sleep, we awoke to more snow – just a dusting this time. Two weeks before and during the heaviest snowfall of the winter the staff were busy clearing the drive and digging paths to make life as easy as possible for their guests. Breakfast is served in the same room as dinner and has an equally appealing menu. Alongside your usual full Scottish and vegetarian options they also offer Arbroath Smokies, Hot oak smoked salmon with poached eggs and their Cringletie House Signature Towers – Neidpath and Smailholm. Smailholm is Border berries, pancakes, smoked salmon and crème fraîche and the Neidpath is bacon, pancakes, sliced tomato, mushrooms with a poached egg on top. Both sounded like a great alternative to the usual offering. To start with, a cold continental breakfast selection is laid out for you to help yourself and porridge (complete with whisky prunes) is available from the kitchen. Cooked breakfasts are freshly prepared in the kitchen and delivered to your table. 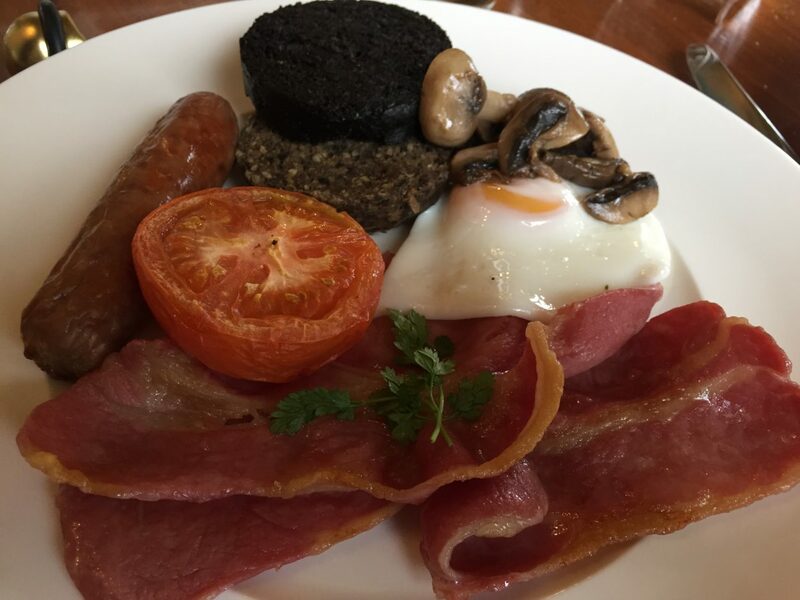 The Cringletie Full Scottish breakfast was delicious – served on hot plates everything was of high quality and well cooked. The menu encourages you to build your own breakfast so you can have exactly what you fancy on your plate. Beans, tattie scones, and hash brown were also available to add. Tea, coffee and toast are brought to your table. 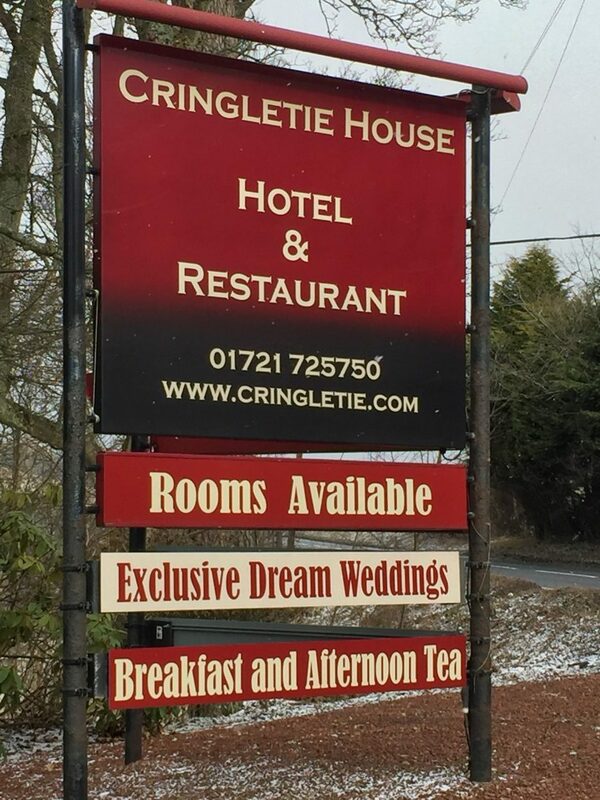 Many thanks to Jeremy and the team for inviting us to sample Dinner, Bed, and Breakfast at Cringletie House as their guests.